Perhaps this is one of many reasons why only 16 percent of B2B consumers prefer live webinars as opposed to accessing the presentation on demand, according to an independent study conducted by Marketing Automation Specialist Mathew Sweezey. In other words, the perception of your attendees can either make or break your webinar or any other Web conferencing session you initiate with partners, customers or key stakeholders. Honing in on reliability and quality, however, can help effectively reverse any negative view that others may be quick to formulate about your brand. Reliability: Unfortunately, many companies become so enticed by the latest and greatest Web conferencing technology that they forget to properly assess its reliability. Remember that even the smallest technical glitch—like a faulty audio connection or a temporarily frozen slide within your presentation— can immediately contribute to the majority percentage of customers who prefer not to attend live sessions. Technical failures or hiccups reflect poorly on a business and can negatively affect brand awareness, customer retention and selling strategies. Quality: Also remember that the presentation must be of the highest quality. Your company’s logo and background should be prominently displayed throughout the presentation, and you should be able to seamlessly adjust video and audio quality settings mid-webinar to ensure the most optimal user and attendee experience. Together, reliability and quality should be driving your webinars toward success. Most importantly, when it comes to a hosting an exceptional webinar, you get what you pay for. As such, it would be wise for companies to invest in an enterprise Web conferencing solution offered by a trusted and reputable provider that will enhance your online meetings instead of detract from them. We’d love to speak with you further about your Web conferencing needs. 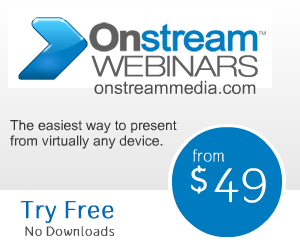 Click here to see if Onstream Meetings could be your perfect Web conferencing partner.